An actor reference is a subtype of ActorRef, whose foremost purpose is to support sending messages to the actor it represents. Each actor has access to its canonical (local) reference through the self field; this reference is also included as sender reference by default for all messages sent to other actors. Conversely, during message processing the actor has access to a reference representing the sender of the current message through the sender method. 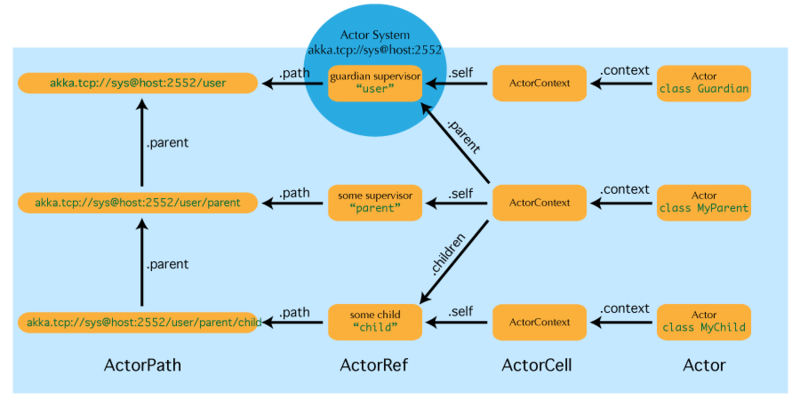 Since actors are created in a strictly hierarchical fashion, there exists a unique sequence of actor names given by recursively following the supervision links between child and parent down towards the root of the actor system. This sequence can be seen as enclosing folders in a file system, hence we adopted the name “path” to refer to it. As in some real file-systems there also are “symbolic links”, i.e. one actor may be reachable using more than one path, where all but one involve some translation which decouples part of the path from the actor’s actual supervision ancestor line; these specialities are described in the sub-sections to follow. That definition does not hold for actorFor, which is one of the reasons why actorFor is deprecated in favor of actorSelection. Here, akka.tcp is the default remote transport for the 2.2 release; other transports are pluggable. A remote host using UDP would be accessible by using akka.udp. The interpretation of the host and port part (i.e.``serv.example.com:5678`` in the example) depends on the transport mechanism used, but it must abide by the URI structural rules. actorFor is deprecated in favor of actorSelection because actor references acquired with actorFor behave differently for local and remote actors. In the case of a local actor reference, the named actor needs to exist before the lookup, or else the acquired reference will be an EmptyLocalActorRef. This will be true even if an actor with that exact path is created after acquiring the actor reference. 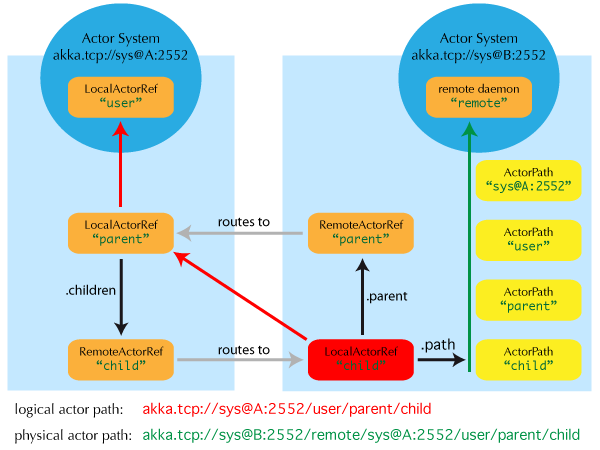 For remote actor references acquired with actorFor the behaviour is different and sending messages to such a reference will under the hood look up the actor by path on the remote system for every message send. Absolute paths may of course also be looked up on context in the usual way, i.e. will send msg to all siblings including the current actor. As for references obtained using actorFor , a traversal of the supervision hierarchy is done in order to perform the message send. As the exact set of actors which match a selection may change even while a message is making its way to the recipients, it is not possible to watch a selection for liveliness changes. In order to do that, resolve the uncertainty by sending a request and gathering all answers, extracting the sender references, and then watch all discovered concrete actors. This scheme of resolving a selection may be improved upon in a future release. actorFor (deprecated in favor of actorSelection) only ever looks up an existing actor, i.e. does not create one. Remote actor references acquired with actorFor do not include the full information about the underlying actor identity and therefore such references do not compare equal to references acquired with actorOf, sender, or context.self. Because of this actorFor is deprecated in favor of actorSelection. When an actor is terminated, its reference will point to the dead letter mailbox, DeathWatch will publish its final transition and in general it is not expected to come back to life again (since the actor life cycle does not allow this). While it is possible to create an actor at a later time with an identical path—simply due to it being impossible to enforce the opposite without keeping the set of all actors ever created available—this is not good practice: remote actor references acquired with actorFor which “died” suddenly start to work again, but without any guarantee of ordering between this transition and any other event, hence the new inhabitant of the path may receive messages which were destined for the previous tenant.